In the mist, Mei was walking along the path surrounded by green trees. Just like her sister, Mei (Star Fire) also didn’t know why she came to this place, as if it was a natural habit of the body itself. Pushing aside the bushes around the path and walking into the mist, Mei finally came to a medicinal field where there were cultivated a lot of pink plants. It was the secret garden of the Starwing Knights. However, it wasn’t Lulu in the medicinal field this time but a golden hair female knight whose body basked in the sun. “Mei.” Hua Yue smiled and smiled like a princess. She stretched out her hand to Mei. She wouldn’t make the same mistake again. Since she had confirmed that Mei was in a strange state now, it would become the best opportunity. Lulu and Ling Ling, the things happened before were all under her monitor. About the news in the girls’ dorm this morning, she also received the report from other noble girls of the Starwing Knights, this was her privilege as the leader. Because everything was too fast, she even felt a bit flat-footed. Her mind wasn’t as simple as Ling Ling, so she wouldn’t move without a thought; neither was she as apprehensive as Mei Lan, who thought too much which conversely made her lose the chance. As the princess of Hua family, the leader of the Starwing Knights, her individual talent and leadership ability were both the number one amongst all girls. She obtained it through her personal charm. Starting from the most trivial things, she never relaxed her vigilance and always played her role well. No matter who she faced, she could always switch her two relationships with others. One was her relationship as a friend of the girls of the Starwing Knights. The other one was her relationship as the leader of the girls of the Starwing Knights. She could stroll around the streets together with noble girls, talking about the latest trends of the endless god’s domains. She could also practice her sword together with civilian girls, pointing out their shortcomings in the meantime. Compared to Xiao Cao who was too devoted to her limit practice, which made her rare to appear in front of the public recently, her leadership was the biggest reason that she was voted by everyone. Maybe someday, Xiao Cao’s sword skill would surpass her sword skill, becoming the strongest in the Starwing Knights. After all, she was the hardest working female swordsman that was recognized by everyone. Even so, as the princess of the Hua family, she was more suitable to be the leader. Her White Golden Rose Bloodline didn’t stand for the strongest bloodline of fighting alone, on the contrary, it was a bloodline of leadership, the royal bloodline that could unite 100% of the power of the team she was leading. Her sword skill was from Shin’Ra, a holy crossed sword created by her legend ranked ancestor, a glorious White Golden Rose Knight. It was a sword of holy light, which wasn’t the strongest, but stood for glory and hope that could bring victory. The old bloodline granted her a strong personality and the will of pride, and her sword combined the two advantages of defense and attack, was the most stabilized crossed sword skill. Her pursuit was to be a perfect knight. She clearly understood the meanings of humility, integrity, compassion, bravery, justice, sacrifice, honor, and soul! Just like the knight’s creed, she made the oath to her sword. The knight’s creed was what Hua Yue vowed to conform to in her life. Because of the eight virtues of the knight, although she knew what happened here before, she wouldn’t let anyone know. Not only so, but she would also help them keep this secret because this was her duty as their leader. However, just slightly, when Mei is in this special mood, I can be more intimate with her. Can’t I? I will only do this one time, and never have a next time! The princess of the Hua family won’t take advantage of others’ difficulties, therefore, this is just a simple date! Hua Yue convinced herself in her heart. “…” Mei (Star Fire) blinked her eyes. She didn’t know what she should do at this time. Hum, according to the memory left by my sister, I should do nothing and my master’s body would react naturally. Yes, this is it! Just let master’s body move following its instinct! “Patter! 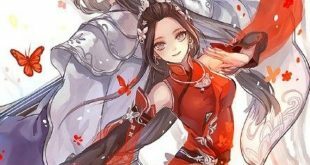 Patter!” Mei (Star Fire) naturally walked to Hua Yue and stretched out her hand. Good morning… oh!” Hua Yue was going to hold Mei’s hands, beyond her expectation, Mei’s hand directly bypassed her hand and put it on her full breasts. “Mei!” Hua Yue’s face instantly turned red. Her hand grasped Mei’s hand. “…” Mei (Star Fire) innocently looked at Hua Yue, whose body shivered with both a funny and annoyed look on her face. Isn’t this the place that master’s body will do “this thing and that thing” with the girls he likes?